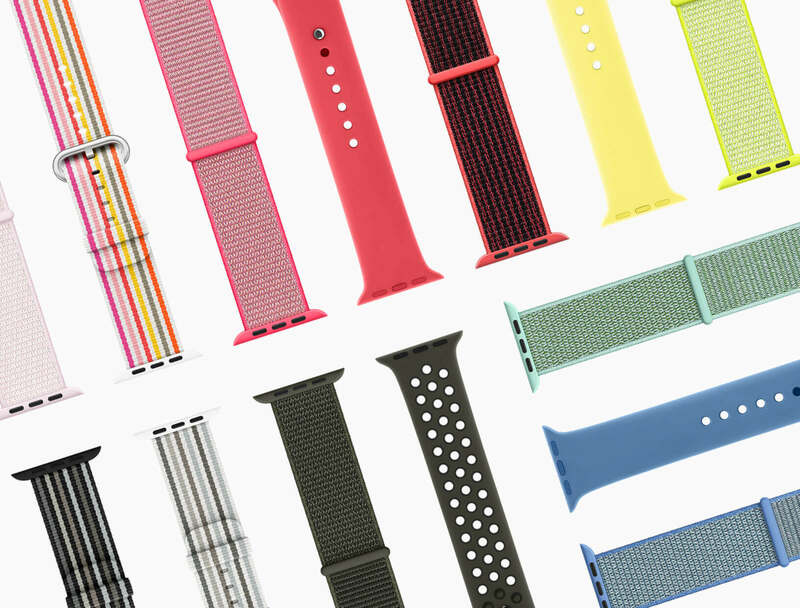 Now that a new season is upon us, Apple has released the Spring collection of Apple Watch bands with bright colors and new designs. Woven Nylon bands with new striped patterns and Nike Sport bands to match shoes are available. Hermès bands bring a smooth leather appearance for a more classic style. The Sport Band will be available in Denim Blue, Lemonade (yellow), and Red Raspberry. Nylon options come in black, blue, gray, and pink. Sport Loop bands now come in Flash Light, Hot Pink, Marine Green and Tahoe Blue. The original Classic Buckle comes in yellow, blue, and Soft Pink. Nike Sport Loop bands are intended to match Nike's existing line of running shoes. The Apple Watch Nike+ model will get the Midnight Fog band by default with the option to pick up a Black/Pure Platinum, Bright Crimson/Black, Cargo Khaki, or Pearl Pink band at a later time. Apple's Hermès bands offer a more refined look with contrasting colors and conservative appearance. The Single Tour Rallye and Double Tour bands arrive in Indigo and white (Blanc). The Single Tour Rallye is shown below with circular styled cutouts that mimic the design of Hermès driving gloves. The Double Tour watch band wraps around the wearer's wrist twice with smooth leather. Although the design is simple and clean, the price will surely scare away all but those with an interest in high fashion. Woven Nylon, The Sport, Sport Loop, and Nike Sport Bands will retail for $49 with the Classic Buckle set at $149. The Single Tour Rallye is priced at $439 with the Double Tour band at $489. All of these prices are inline with currently available accessories and are not an increase over previous watch bands. All new bands will be available from Apple and select models from Nike before the end of this month. What was the first wristwatch with the ability to make phone calls?